SLT3060AH-OK-CAST Size: 29" H x 60" W x 30" D, Leg Color: Oak Features: -Adapts for ADA requirements. -Caster wheels. -Easily adjusts. -With pre-drilled pilot holes. -Oversized matching floor glides standard. Includes: -Table only. Product Type: -Science table. Surface Type: -Chemical-resistant. Shape: -Rectangle. Commercial Use: -Yes. Adjustable Height: -Yes. Dimensions: -Weight capacity 500 lbs. Size 29" H x 48" W x 24" D - Overall Table Height - Top to Bottom: -29". Size 29" H x 48" W x 24" D - Overall Table Width - Side to Side: -48". Size 29" H x 48" W x 24" D - Overall Table Depth - Front to Back: -24". Size 29" H x 54" W x 24" D - Overall Table Height - Top to Bottom: -29". Size 29" H x 54" W x 24" D - Overall Table Width - Side to Side: -54". Size 29" H x 54" W x 24" D - Overall Table Depth - Front to Back: -24". Size 29" H x 60" W x 24" D - Overall Table Height - Top to Bottom: -29". Size 29" H x 60" W x 24" D - Overall Table Width - Side to Side: -60". Size 29" H x 60" W x 24" D - Overall Table Depth - Front to Back: -24". Size 29" H x 72" W x 24" D - Overall Table Width - Side to Side: -72". Size 29" H x 60" W x 30" D - Overall Table Height - Top to Bottom: -29". 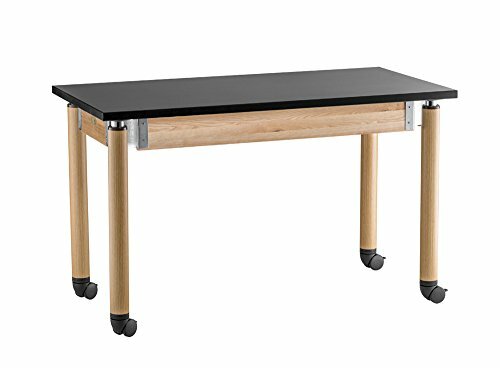 Size 29" H x 60" W x 30" D - Overall Table Depth - Front to Back: -30". Round legs have a 23/8" diameter, and are offered in: stylistic matching light oak woodgrain. striking textured black. Legs adjust smoothly and easily in 3/4" increments - from 29" to 41" height. Adapts for ADA requirements. Easy assembly, with pre-drilled pilot holes. Weight Capacity: 500 lbs.